Recently I have been posting heaps of sweet treats – #pimpingpaleo! So for the next few postings you are going to see more savoury recipes to balance it all out! 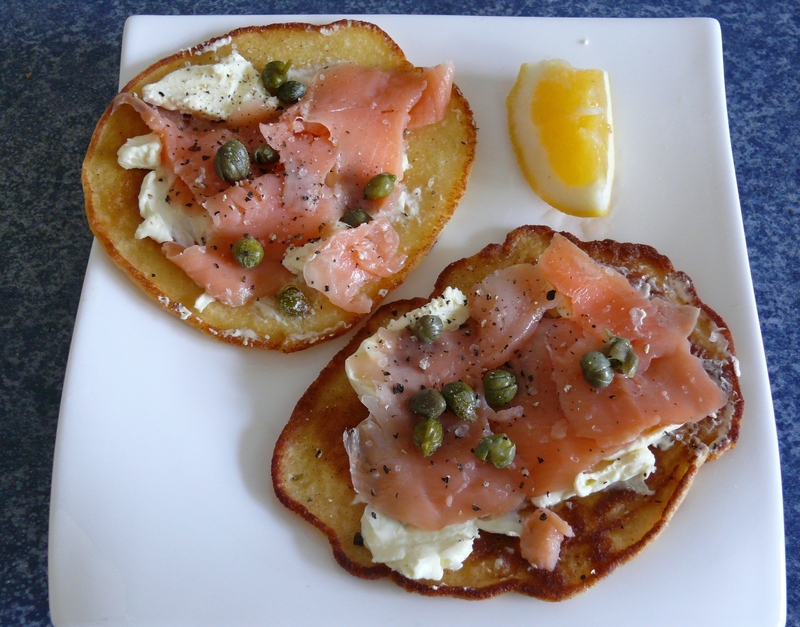 The first hitting the interwebs is… tada… Primal (cos I’m using dairy) Smoked Salmon & Cream Cheese Blini. Why blini, beside its history, I think it sounds so much more classy and exotic than piketes, don’t you? Sometimes you just need a little something under your smoked salmon. So searching the web for a paleo or primal blini/piklete/pancake recipe I found this one at wholesomekids. It was so quick and easy to make, I had them out of the mixing bowl, into the pan and onto the plate in less than 10 minutes. Perfect for a weekend brunch/lunch or how about making them tiny and cute to taste tempt a party. • Mix all the dry ingredients together to get rid of any lumps. • In a separate bowl whisk together all the wet ingredients accept for the butter/oil. • Whisk the wet mix into the dry until smooth. • Heat the butter/oil in a large pan and when hot, fry in batches using a large spoonfuls of the mix. I can get 4 going at once in my pan. • When you see bubbles forming lift gently to check the colour. • Top with your favourite topping. Cream cheese, Smoked Salmon, Capers, Squeeze of lemon juice & freshly ground salt and pepper to taste. Avocado, sliced tomato, cucumber and a dollop of homemade mayonnaise. Caramelised onions and quality ham. Chicken, brie and a dollop of homemade mustard mayonnaise. The traditional topping is sour cream caviar or smoked salmon. As I mentioned above you can make these into tiny canapé size, use your imagination with some colourful toppings. Have fun!